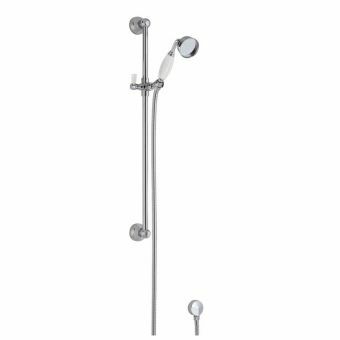 Free DeliveryGrohe Power&Soul Cosmopolitan 160 Shower Rail Set with 4 Sprays£162.36 inc.VATRRP: £249.78 (Save 35%)Includes adjustable 600mm shower rail. 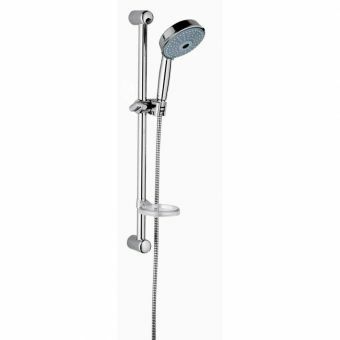 Large 160mm wide shower head with 4 spray patterns, requires a shower valve. 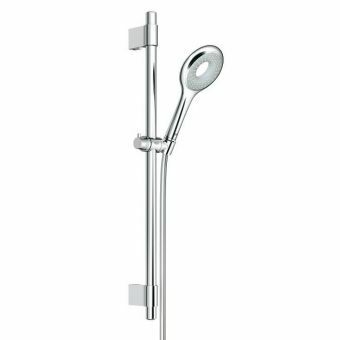 Hansgrohe Raindance Select S 120 3Jet Hand Shower with Unica Comfort Shower BarFrom £256.75 inc.VATRRP: £395.00 (Save 35%)Left or right-hand fitting, with chrome or chrome/white colour options for hand shower, and a useful footrest. 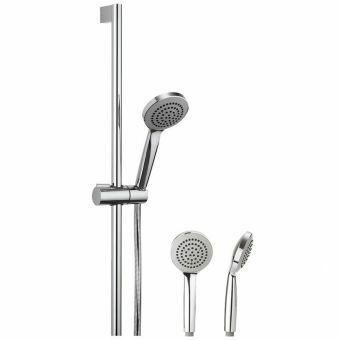 AXOR Uno² Shower Set£211.25 inc.VATRRP: £325.00 (Save 35%)3 jet wall hung shower set with round head. 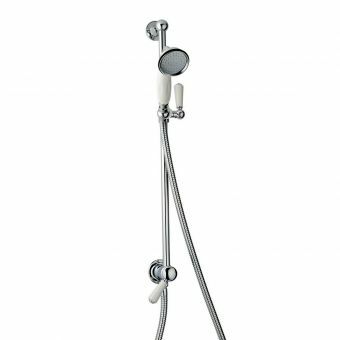 Technology in shower sets has moved on a long way from the early days of a mixer unit that blended the hot and cold water supply to a shower head at the temperature which suited the user. It could be quite a hit and miss operation, particularly if the cold supply was fed directly from the main supply and the pressure was high. This could and often did, result in the cold supply being too strong, the result being a weak and often cool shower. No such problems today with modern mixer units, many of which are thermostatically controlled to guarantee the correct temperature for the user each and every time. 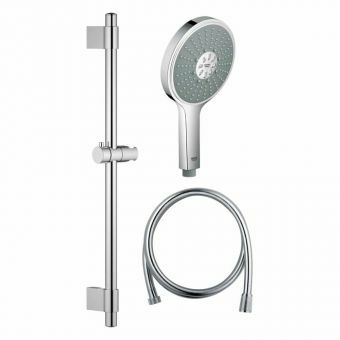 But it is not just about water adjustment; at our shower kits web pages we have a wide variety of complete or partial shower kits which are designed to help you choose a new shower, or possibly upgrade and existing one. 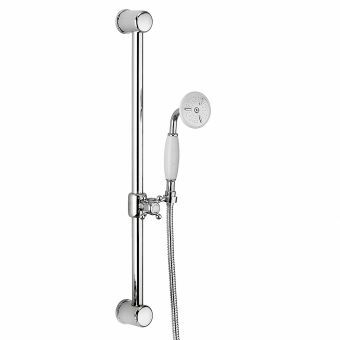 At the pages, you will be able to see close to four hundred kits and these include the very latest thermostatic mixer units, slider rails, and a variety of shower heads that incorporate the very best in spray technology. 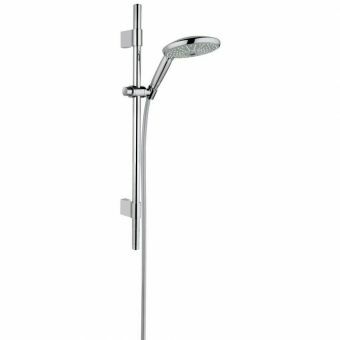 Why not fit a new and trendy coloured spray head, take a look at the Grohe Rainshower Icon Watercolour Hand Shower, this has a universal fitting and is sure to fit your existing fixture. 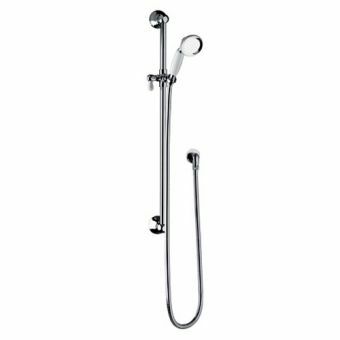 As always our prices on shower kits cannot be beaten and you will see by looking through the pages that a new modern shower kit does not have to cost a lot of money. 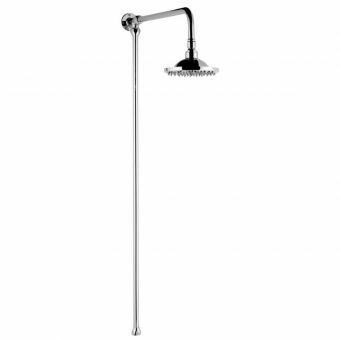 A shower rail, or shower set, is a shower head with a hose and a rail that is mounted on the wall. Modern sets are thermostatically controlled to guarantee the correct temperature for the user, and there are lots of extras you can add to your set too. Some rails already come with additional extras, such as adjustable soap dishes and a flex hose. Other extras include slider rails and different spray heads. You can select from almost 400 kits – just check the product description for more information. 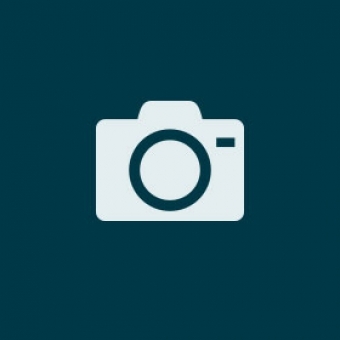 Design: what do you want it to look like? What added extras would you like? Water pressure: how powerful is the water pressure in your home? 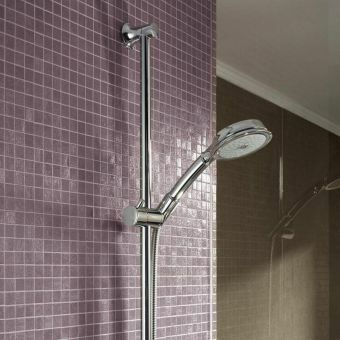 The type of water pressure in your home with tell you what kind of shower you need. Check your water pressure by using a pressure gauge, but if you’re not comfortable doing this, call in a professional instead. Once you know your water pressure, you’ll find out what shower suits your home best. Water system: there are usually three types of water system in UK homes – which one do you have? 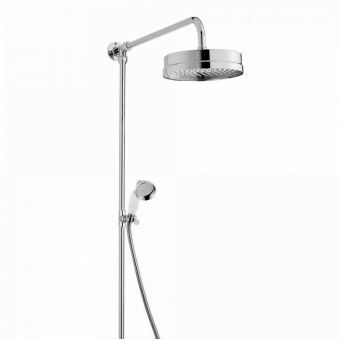 The type of water system you have will affect the type of shower you can install. This is the most common water system in the UK. There is usually a water tank in the loft and a water cylinder in an airing cupboard. The water in the cylinder is heated by a boiler or immersion heater and fed to the taps. This can result in low water pressure because the water is fed by gravity. The higher your tank, the greater the pressure. 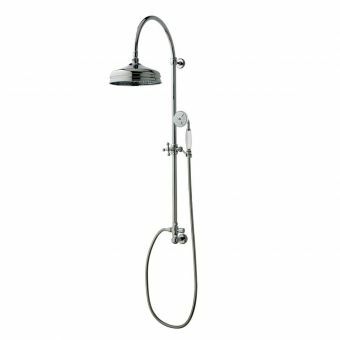 You can add a shower pump to boost the pressure, which is a good option for larger homes with multiple showers. Combination, or combis, are boilers with no tanks or cylinders. They heat water as and when you use it. The boiler is typically wall-mounted, and they provide the highest possible water pressure. Unvented water systems consist of a water cylinder heated by an immersion heater or boiler under high pressure. 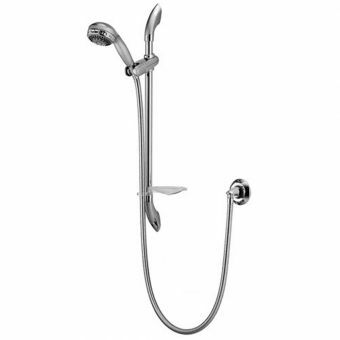 This allows large volumes of hot water to be supplied and usually has a strong pressure. 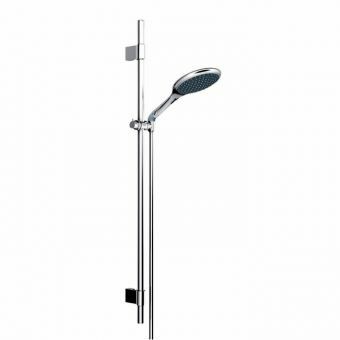 Types of shower: what function does the shower need to perform? 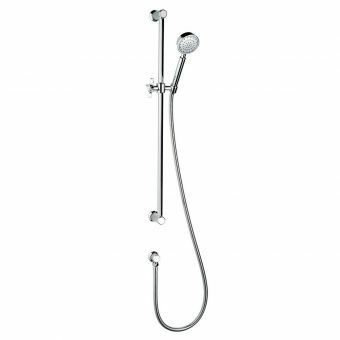 As well as the water pressure, you need to consider what functions the shower needs to have, and what would look best in your bathroom. 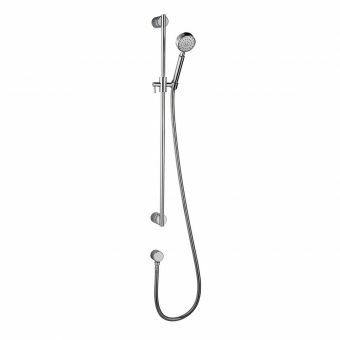 There are a variety of styles of shower rails and shower heads to choose from. 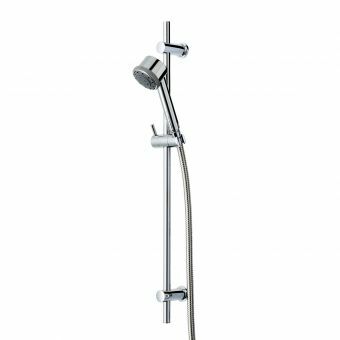 With a selection of either a 350mm shower arm or 460mm shower arm, you can pick a shower that suits you. 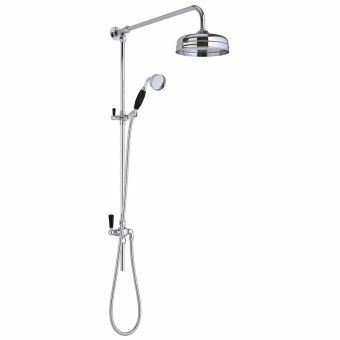 The kit comes with a luxurious 240mm overhead shower with a wall-mounting plate and a flexible shower attachment. 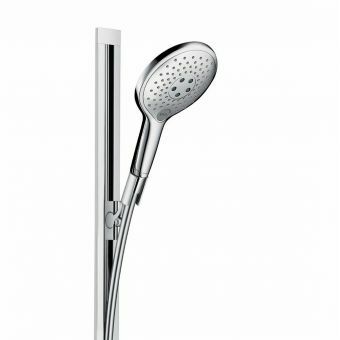 The fixed shower head has AirPower technology for a more voluminous spray, drenching you with water. 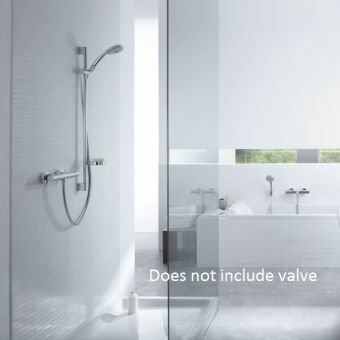 It’s also fitted with EcoSmart technology, which reduces water consumption by up to 60%. 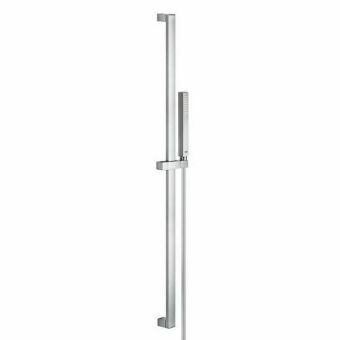 Perfect for a tailored shower experience, the Imperial Bathrooms Traditional Slider Rail measures 725mm (height) with a 75mm (depth). The Kit can be customised to your tastes – select from either a chrome, gold, or nickel finish. 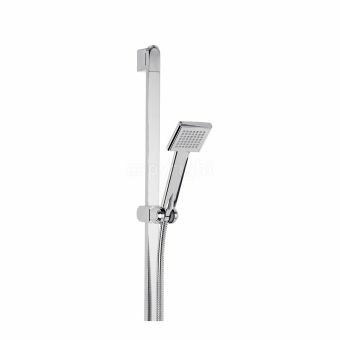 This chrome shower rail comes with a hand shower, mounting rail, 1750mm shower flex, and you can select from one of four different spray patterns. 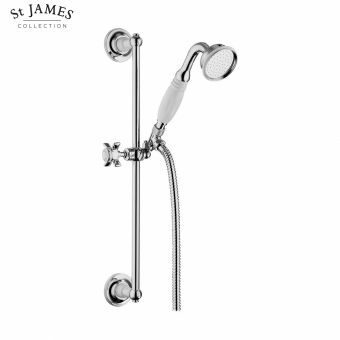 The classic design gives a modern feel to any bathroom, and it's perfect for anyone looking to update their shower space. 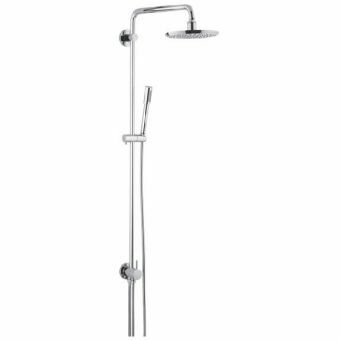 However, this set is only compatible with systems operating at over one bar of water pressure. 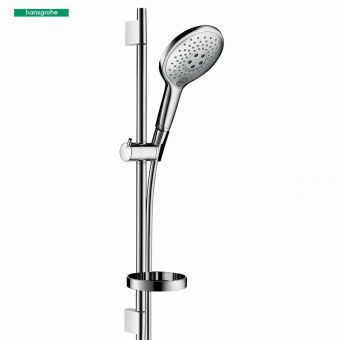 The Hansgrohe also comes with a soap dish, a Unica S shower riser, a matching wall outlet, Select push button shower control and a five-year guarantee from the manufacturer. 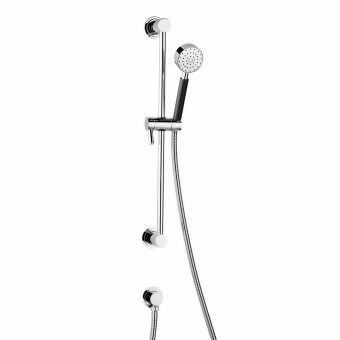 This shower set is modern and adaptable – the options are endless! 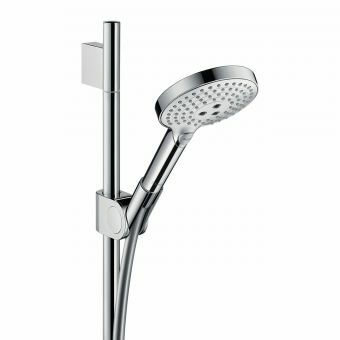 The combination shower head gives you both fixed and riser shower heads for maximum versatility. They look sleek and stylish, but they’re also luxurious. Why not try one of these? 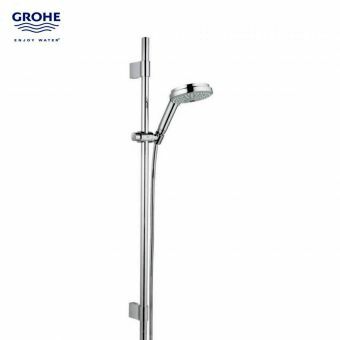 Included in the Grohe Rainshower system is a jumbo 400mm shower head to offer a full steady stream of water. 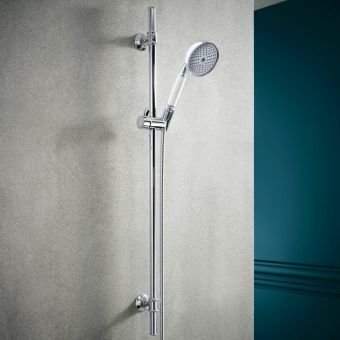 Coming in a chrome finish, the System also comes with a 1,011m rail, an adjustable Sena hand shower and metal threaded shower hose which connects to a shower valve or wall union. We promise fast shipping to our shoppers. 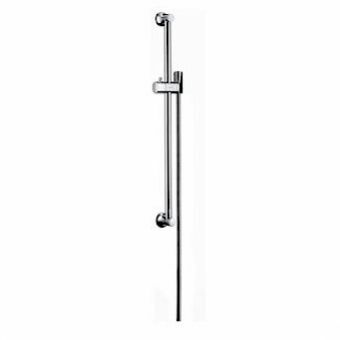 Whatever your requirements, needs or decor, we have a shower rail that will work for you. With fast shipping and a variety of price points, there are plenty of options to browse through. Call us on 01765 694 720, 9am-5pm, and we'd be happy to help.